There is nothing quite like the feeling of knowing your skin looks smooth, creamy in the right places, cut in the right places, and your makeup sits just right. Aside from all the work it took you to get the base for all this hard work looking pretty, the peels, the scrubs the masks and the endless glasses of water – what is the one ingredient that you can’t afford to skip or skimp on? Because some people out there still aren’t using a primer, let’s quickly touch on the basics before we offer up some gorgeous options (for all budgets). A makeup primer is the base of the face make-up. It comes in gels, creams and powders. It fills in large pores, smooths wrinkles, and fine lines. Rather than your foundation clinging on to your skin all day long, the primer does the hard work here. It creates a thin, flawless base and can keep you looking matte or dewy all day long – depending on the look you were going for. Purchasing primer might feel more complicated than house buying, but really it comes down to how you want your face to feel. Some makeup artists say apply your primer with your fingertips. Why? Well, the warmth of your fingers helps work the product into the places it needs to go. You can also be a little bit pickier – matte eyelid primer for oily lids, shine control in t-zone and so on. 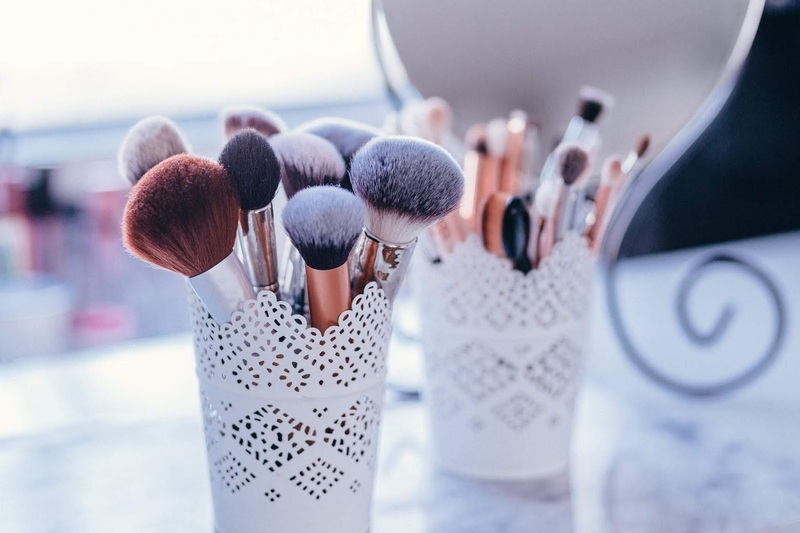 If you are only using it to cover areas like enlarged pores, or a few wrinkles, then a brush will do the trick. Once you have applied your primer wait for the product to dry down before you start your regular makeup routine. Some stay slightly tacky; others are a powdery finish. Work with what you have. Yes. You can use it alone for a smooth, even skin tone with minimal effort or under a full face. Either way – use it. *NOTE – not all primers will work with all foundations due to formula. Trial and error. The Ordinary has two amazing primers for under £6 each. One is a High Adherence Silicone (£3.90) primer, and the other is a High-Spreadability Fluid Primer (£5.50). The difference? Well, it’s pretty much all in the name, one will hold on to your foundation like Jack and Rose from the Titanic (was there room or wasn’t there? ), the other is going to give you some movement to make sure you aren’t patchy. They’re both hydrating and claim an airbrushed finish. The Ordinary is known for being a fantastic budget brand, great ingredients and a cult following. Frankly, for less than £6 it’s worth the risk. MUA - Undress Your Skin Flawless Skin Primer, £5 on the MUA website (cheaper elsewhere). This leaves a velvet feel to the skin, fills pores with ease and softens up fine lines too. This primer works with budget foundations or high-end foundations. Looks great alone also. The Pro-Base is £4 and has added vitamins A & E plus tea tree, smooth base plus some perky looking skin. Their eye primer is a snip at £2 too, makes your eye shadow last longer and avoids creasing and oily lids. 3 Concept Eyes – Back to Baby Pore Velvet Primer, the slightly higher end of the budgets, at £11. This one focuses on blurring blemishes, minimising those pores, and mattifies the skin too. It smells fabulous, and although it is slightly on the thicker side – it feels light, and your skin is still able to breathe. Winner winner. Smashbox – The list wouldn’t look right without Photo Finish. This primer has a very loyal following, and that is excellent news. Why? Because it means they launched a whole bunch of primers to suit different skin types. There is a pore minimising one, an oil-free one, primer oil, primer water… But, the original is the cult classic for a reason. For something a bit different you can use the primer stick – the application is faster, it’s about £4 cheaper, and it has 12-hour shine control. Touch in Sol – No Poreblem Primer £15, does what it says on the 30ml bottle. It’s a South Korean miracle primer. It has a unique power that controls oil and creates a velvety texture. Loaded with green tea extract and collagen, it protects the skin too. Smells fairly lux and has rave reviews. Hourglass, No. 28 Primer Serum £24. Packed out with 28 skin-loving ingredients, it’s silky, lightweight and hydrating. It softens lines and wrinkles too. The formula repels water, so it keeps you looking fresh all day long. The oil soaks into the skin and will ‘re-texturize the surface’ ready for your foundation. Stila Cosmetics – Y’know those gorgeous tubes with the product in a helix? Yeah, that. The swirled-up formula combines two formulations in order to products something pretty amazing. It fills enlarges pores, fine lines and leave you with a fresh and flawlessly smooth canvas. Packed out with vitamins and antioxidants – it brings something a little special to the primer game. Guerlain L’or Radiance Concentrate with Pure Gold – with actual gold in it, you won’t be surprised this one rides into town at £47 for 30ml. The plentiful gold flecks act as light reflecting particles, which instantly brighten up your skin. It’s scent, peach, rose, raspberry and jasmine – so you smell as expensive as you feel with it on. It’s hydrating, smoothing, and leaves skin supple and satiny. Lancer Skincare Studio Filter Pore Perfect Primer – at £58 for 30, and a mouthful of a name you might be expecting miracles, well you might not be far wrong here. This is an award-winning primer, with Porifin Complex which refines the look of pores and uneven skin – leaving a fresh matte finish. It’s oil-free and brimming with something called Acmella Oleracea… which basically helps you look younger and blurs out those pesky fine lines. By Terry – Hyaluronic Hydra Primer. This one is a neat £42 for 40ml, so that little bit extra on the previous two. The hydra-plumping hyaluronic acid (isn’t as scary as it sounds) micro-spheres and resurfacing polymers whizz around your face, visibly reducing and sealing up those wrinkles, pores and imperfections. It has colourless correction technology which means it leaves you looking like you have nothing on your face if you choose to skip foundation after applying – unlike others that often leave a light powdery look. Charlotte Tilbury Wonderglow, £38.50 for 40ml. Sneaking into the last spot is this wonder tube. This is zing for the skin. Boasting a breakthrough formula that diffuses UV light around the face making you look luminous and healthy. Transforming your dark circles, lines, pores, wrinkles and some of those years you have acquired in the form of ageing. It is designed to give a spotlight effect all by itself, the light-reflecting micro-spheres fill up wrinkles and blur away everything else. Alone it will provide a relaxed, dewy and healthy skin look. Under foundation, it will keep you hydrated and give a radiance to your everyday look. So, there you have it, a primer for every pocket. The obvious thing to mention is that most primers will work better with the foundation from the same brand, the ingredients tend to work well together – that said it is worth spending a few days experimenting to find your perfect combination.